GERALD PADILLA: Tony, thank you for being on Latino Book Review. TONY DIAZ: Thank you for helping us spread the word about la palabra. PADILLA: A lot of us have heard about the discriminatory and straight out racist laws Arizona has enacted this last decade, including a ban on Mexican American Studies. What exactly does this ban mean and what is at stake? 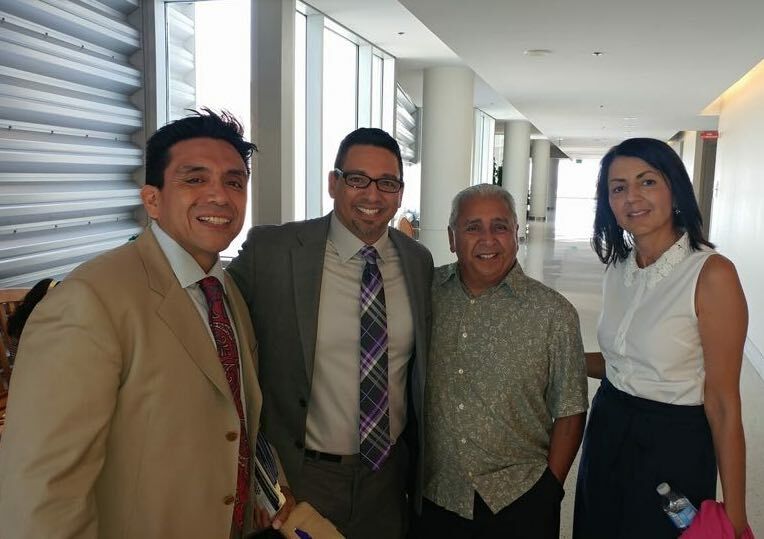 DIAZ: Arizona officials accused the K-12 Mexican American Studies Program at Tucson Unified School District (TUSD) of “promoting the overthrow of the government”. Of course, none of the books that were part of the outlawed curriculum did that. In fact, collections of poetry by Jimmy Santiago Baca and Carmen Tafolla didn’t even have the words “government” or “overthrow” in them. That law is being reviewed at the Arizona Supreme Court. Week 1 runs from Monday, June 26, 2017 to June 30. There is another week of trial in July 17 – 21, 2017. If this law is allowed to stand, it could spread faster and farther than Arizona’s anti-immigrant laws spread. This could destroy freedom of speech and intellectual freedom in every state of the union. ​PADILLA: El Librotraficante movement is known for smuggling banned books into Arizona. How does this work? 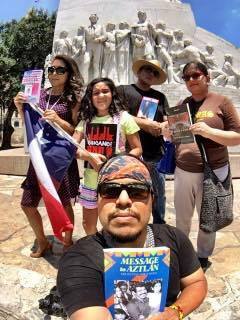 Librotraficnates pose with banned books in San Antonio. 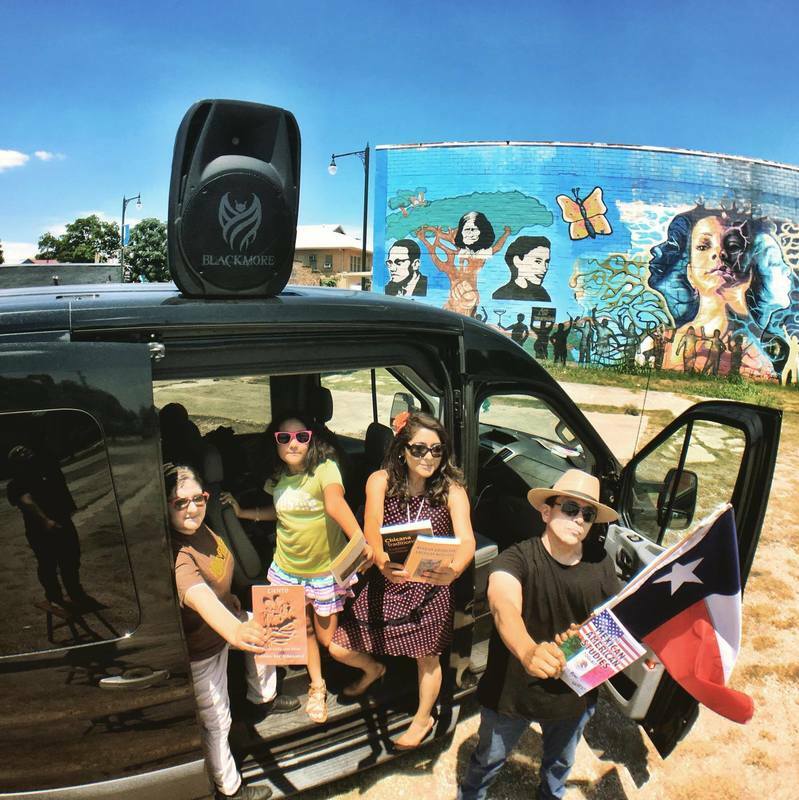 DIAZ: Our 2017 Librotraficante Caravan from Houston, Texas to Tucson, Arizona stretched 1,100 miles. You can follow the route on our website www.Librotraficante.com. That is a map to the Chicano literary legacy of the Southwest, as we stopped and convened with authors such as Sandra Cisneros, author of House on Mango Street; and Rudolfo Anaya, author of Bless Me, Ultima, whose works were part of the now-outlawed curriculum. Writer Dagoberto Gilb, author of “The Magic of Blood”-banned in Arizona-joined us on the bus in 2012. We opened Under Ground Libraries at our stops along the way. The goal is to make sure that our community’s access to its literature is never at the whim of an administration again. We have Librotraficante Under Ground Libraries in Houston, San Antonio, Albuquerque, and Tucson, among other cities, and they are thriving. ​The Librotraficante Under Ground Library in Albuquerque is located Los Jardines Institute which is run by Richard Moore and Sofia Martinez who helped edit one of the classics banned in AZ-500 Years of Chicano History in Pictures, with Elizabeth Martinez. They have a thriving center which utilizes the Under Ground Library in unique ways organic to the community. Members included the UG Library in the mural along the back fence of the property behind the community gardens where participants can profoundly understand how our literature, our environment, our surroundings are all linked. It was potent to visit and re-stock their shelves with banned books. PADILLA: What is the current status on the Mexican American Studies ban? DIAZ: Let’s make one thing clear. Arizona’s current law is dangerous. It is so broad that it can be used to prohibit any course officials dislike. Arizona HB2281 which is now AZ ARS 15-122, tramples on Intellectual Freedom and Freedom of Speech. It must be over turned. On the other hand, there has been some major push back. So with the 2012 Librotraficante Caravan we joined a nationwide movement to put that un-American, discriminatory law in check. It did not spread the same way Arizona’s Anti-immigrant law SB1070-The Show Me Your Papers Law-spread. Also, the cultural crisis in Arizona woke us all up. California now has several major school districts where students must take Ethnic Studies in order to graduate high school. In Texas, we thwarted any bills that adopted the same language as the AZ ban. We also were able to push for more classes and also a call for Ethnic Studies textbooks. That’s a longer story, but the good news is that on June 7, I submitted to the Texas State Board of Education, The Mexican American Studies Toolkit, for which I am the lead writer and editor. That textbook is already available for schools to adopt, but it is also going through the process of approval of adoption state wide. Tony Diaz is the lead writer and editor of the textbook "The Mexican American Studies" which was submitted for consideration of adoption in Texas high schools. So here is the irony of our time, as The Librotraficantes ride 1,100 miles to witness the court case that could decimate Ethnic Studies in every state of the union, we are carrying with us the textbook that might spread Mexican American Studies faster than ever. PADILLA: What has been the response within our community? Have other organizations become allies with the Librotraficante movement? 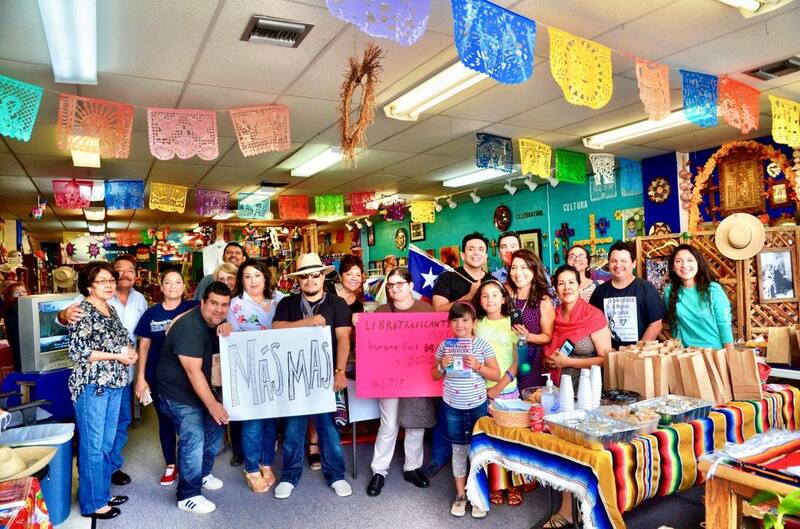 The 2017 Librotraficante Caravan launched from Casa Ramirez folk Art Gallery in Houston, Texas. Photo Credit | Juan Parras. DIAZ: It is powerful to see the Librotraficante Under Ground Libraries thrive. We revisited and restocked their shelves on the 2017 Caravan. We also have many other allies including Chicana literary icon Denise Chavez, author of “Loving Pedro Infante”, among other works, who hosted a reception for us at her book store and cultural center Casa Camino Real in Las Cruces, New Mexico. She donated books and also organized a community reception. The El Paso community once again organized a powerful reception which included Danza, poets, writers, and community members at Café Mayapan. Book donors include Arte Público Press, Wings Press, Cinco Punto Press, and so many others. The outpouring of support has been powerful and keeps growing. Of course, groups such as The National Association for Chicana and Chicano Studies (NACCS), and the NACCS Tejas Foco have put out statements against the ban, as have non-Latino groups. Most recently Pen America condemned the Arizona MAS ban and called it out as an attack on Freedom of Speech. The Librotraficantes arrive to San Antonio on their way to Tucson, visiting Librotraficante Under Ground Librarties along the way. PADILLA: What can our community members do to collaborate and fight against this discriminatory law? DIAZ: Spread the word. Tell your family, friends and community about the ban and about the court case at the Arizona Supreme Court. This means retweeting and reposting and sharing information through social media. This also means telling folks about this the old fashioned way-one tía & tío at a time. Folks can also help spread Chicano, Latinx, and other Ethnic Studies. This can be as simple as reading some of the brilliant works that were part of the outlawed curriculum. If you visit www.Librotraficante.com and click on the “Banned” tab, you can read the annotated bibliography. 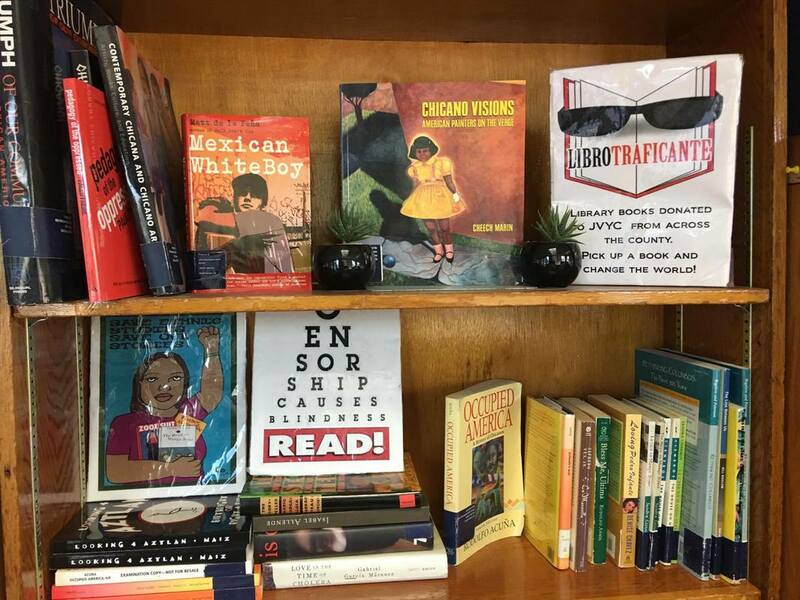 These include “Wood Cuts of Women” by Dagoberto Gilb; “Always Running” by Luis Rodriguez; “Lover Boys” by Ana Castillo; even Isabel Allende is on the list. Folks can also organize affinity events that can include exhibits of the banned books. They can also support the Xito Institute which some of the original Tucson K-12 MAS instructors are now a part of. Xito is an education consulting collective committed to assisting urban school districts, higher education institutions, school administrators and classroom teachers to create inclusive, vibrant and dynamic learning environments. Be vigilant. Look for potential laws and policies in your state that are might be copying parts of the Arizona law banning Mexican American Studies and nip it in the bud. Bolder steps include starting Ethnic Studies classes in the community or as part of classes that already exist. The next step is to push for formal implementation of such classes in an entire school district and/or state wide. Folks can also go to Tucson for the subsequent parts of the trial. PADILLA: Where can we find more information regarding any updates about the Librotraficante movement? DIAZ: Folks can find out more by visiting our website www.Librotraficante.com. We are on Facebook, Twitter, and Instagram under the same name. Also, they can tune in to our radio show Nuestra Palabra: Latino Writers Having Their Say ON THE Air, Tuesdays 6p-7p cst, 90.1 FM KPFT. The radio show is live streamed on www.KPFT.org and on iTunes. Also, The Nuestra Palabra Collection is housed at the Houston Metropolitan Research Center, part of the Special Collections Division of the Houston Public Library System. Nuestra Palabra radio show broadcasts are archived at the University of Houston Libraries and Special Collections. PADILLA: Would you like to make a direct call of action to our readers to energize their spirits in these times of turmoil? DIAZ: It seems that Democracy needs to be rebooted every 50 to 60 years. That duty has fallen on the shoulders of Chicanas, Chicanos, and Latinxs this time around. However, we’ve been prepared for this. What our community used to do to simply survive, will now help us thrive, and together we will overcome this oppression and lead the nation into an era of Enlightenment. PADILLA: Tony, it was great to have you on Latino Book Review. On behalf of all of us who hold our heritage dearly, thank you for standing up for our literature, our culture and our future generations. DIAZ: It is a blessing and honor to unite for this great cause. Gracias.